In my earlier essay, “DSCSA ‘Serial Numbers’” I focus on the serial number portion of the product identifier, and in my last essay “Identification Of Pharma Cases In The U.S.” I focus on how the product identifiers would be placed onto cases. In this essay I want to take a look at issues surrounding the application of the product identifier on drug packages. I find it fascinating that Congress specified the exact type of barcode that must be applied by manufacturers and repackagers rather than leaving it up to the FDA or the industry. For a long time I have held the opinion that the data carrier technology used for product identification within a given regulated market must be limited to a small set (preferably only one) of carrier technologies to ensure widespread interoperability (see “Should Regulations Dictate Technology?”). But I also recognize that this approach could stifle technical progress, so I believe that the body that sets the limits must be one that is capable of recognizing when it is time to move to a better technology and has the authority to force everyone to move to it in unison. In the DSCSA, Congress identified that deciding body as the FDA. That’s good because, even though the law specifies a “data matrix” barcode as the data carrier, we do not have to go back to Congress to move to a better technology. And there are already reports of troubles with the speed of printing and verifying Datamatrix barcodes on very high-speed packaging lines (particularly in the tobacco industry but also in the drug industry). This has led people to search for faster 2D barcode technologies. The current darling is call the “DotCode”. The only trouble is, the DotCode is not a GS1 standard symbology so a small group of end users, solution providers and AIDC experts is mounting a quick effort to get GS1 to consider adding it to their list of standard symbologies. A workshop will be held in Barcelona on May 27 to discuss it. Contact Henri Barthel of GS1 for more info. It’s just the beginning of a long and winding road that will likely take years. Fortunately, if the Datamatrix really is too slow for certain drug products, companies can petition the FDA to allow them to use the DotCode or something else. I recommend starting that process now rather than waiting until GS1 “standardizes” the DotCode. That way the two bureaucratic processes might run in parallel. I would like to draw your attention to the fact that the DSCSA requires the NDC to be printed on drugs in human readable form as part of the SNI portion of the Product Identifier. Unfortunately, GS1 US’s recent DSCSA Guidance version 1.1 recommends the printing of the drug’s GS1 Global Trade Item Number (GTIN) for the human readable section next to the barcode. GS1 US refers to it as the “human understandable” data presentation (see page 42). In fact, GS1 normally refers to the human readable data presentation as the “human readable interpretation” or “HRI”. It is normally an interpretation of what is encoded in the barcode. 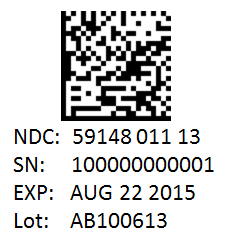 In this case, the barcode will contain a GTIN which is based on the NDC, so it is natural for GS1 US to expect the HRI to contain a human readable GTIN. But because this is a regulated barcode, that would be wrong. In my opinion, to be compliant with the law, drug manufacturers and repackagers should not follow GS1 US guidance in this situation. A GS1 GTIN—even one that is based on an NDC—is not an NDC, so the human readable form of the DSCSA Product Identifier on a drug package should never be formatted or labeled as a “GTIN” but must be formatted as a 10-digit NDC and labeled “NDC”. In my interpretation, it is fine to encode the NDC within a GTIN when it is encoded within the barcode, but not in the human readable data, so technically, this should also not be referred to as the “HRI”. Calling it the “human understandable” is actually a good idea. The difference between the GTIN encoded in the barcode and the NDC in the human readable form is analogous to the difference between the expiration date encoded in the barcode and the formatting of the date in the human readable form. The format of human readable dates can be dictated by regulation, but no regulation should dictate the way a date is formatted within the barcode. That must always be left for the barcode encoding standard to dictate. This issue comes up more with the U.S. Unique Device Identification (UDI) standard than it does with drugs, because the UDI rule enforced by the FDA very deliberately mandates the format of the human readable expiration date but not the barcode encoded format (see “What The UDI Date Format Says About FDA’s Direction”). The FDA does not seem to enforce a particular formatting of the human readable expiration date (I am not an expert on this so check with the FDA). I understand that companies should follow USP guidance for that (again, confirm this with the FDA). My advice for the human readable presentation of the NDC and the date code goes for the label on the drug package as well as the homogenous case label since both must contain the DSCSA Product Identifier. I assume GS1 US has corrected this flaw in their next update of that guidance, which is due any day now (watch the GS1 US DSCSA resources page for the new guidance).